KAPIT: Majlis Amanah Rakyat (Mara) has continued to assist rural communities access their services through its corporate social responsibility (CSR) Heart of Gold programme. The latest such an initiative that reinforces the spirit of unity between Mara and the people, was the four-day Skills Mara-Kapit Heart of Gold programme, held here. Themed ‘Skilled Youth Catalyst of Rural Development,’ the programme was held at the Rumah Empawi in Nanga Sekukut, Sungai Yong, 15km from Kapit town beginning Nov 15. The closing ceremony of the programme was officiated by deputy minister of Rural and Regional Development (KKLW), Datuk Alexander Nanta Linggi, last night. In his speech, Nanta said the implementation of the Heart of Gold programme was to ensure that the rural community was not excluded from the flow of technology, through the development of innovation projects undertaken by the Mara Skills Institute and Development of Urban Farming System. 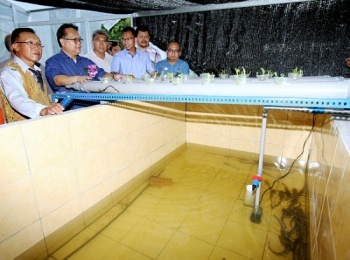 Technology transfers carried out by 43 students and lecturers from IKM Bintulu for the longhouse residents, including the use of greenhouse units, aquaponics and fertigation systems, harvesting system, as well as solar systems. Programme director Michael Jangi, expressed his satisfaction as the longhouse residents have shown good support and deep interest in the programme. He hoped the RM15,000 innovation project would be used by the longhouse residents to modernise agriculture and increase their income in the future and that it would then be emulated by residents of other longhouses around Kapit. Michael also called on youth in Kapit to enhance their job marketability to gain employment, by obtaining qualifications in various skills offered at several Mara institutions. He said that IKM Bintulu offers various programmes under the oil and gas cluster including Welding and Fabrication Engineering Certificate, Structural Fabrication Technology Certificate, Electrical Engineering Certificate, Diploma in Plant Engineering Technology (Instrumentation & Control) and Diploma in Electrical Installation. This entry was posted in Lain-Lain and tagged Heart of Gold. Bookmark the permalink.